I have a secret ingredient that makes any sweet green salad extra yummy. It’s sugared almonds. Have you ever tried them? I made a batch today for this post, and I could seriously eat them all. Forget the salad, just pass the sugar coated almonds! These almonds are perfect for salads with sweet ingredients (like fruit) and or sweet dressings. I love them in salads with mandarin oranges or strawberries (like the strawberry spinach salad I’ll be sharing on Monday). I’m not a particularly fancy person, and I’m all about saving a buck. When I created Monday’s salad, I purchased expensive sliced almonds because I thought they would make the salad look prettier. Well, guess what? 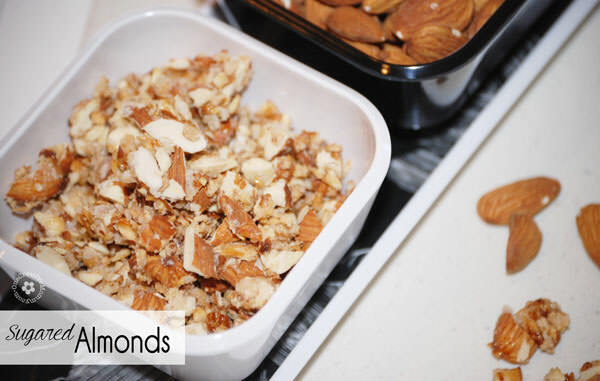 Sliced almonds burn easier, and once they are sugared, they all stick together in clumps! Forget about fancy. This is one time when it’s better to start with whole almonds. (But–if you really like fancy, go ahead.) 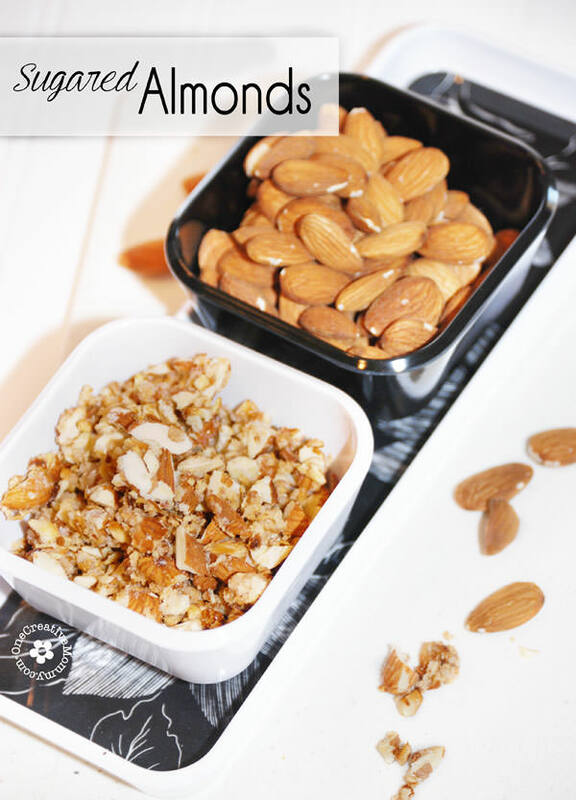 If you are making the almonds for a snack instead of for a salad, you can leave the nuts whole. In a small sauce or frying pan, stir sugar and almonds together over medium heat. Continue stirring until sugar melts and the almonds are coated. 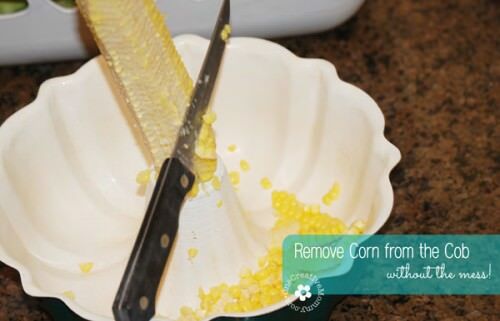 Remove from heat, and pour them onto a plate or bowl to cool. The funny thing about making sugared almonds is that once the sugar starts to melt, it will do so very quickly. That means you have to pay attention! I can’t tell you how many times I’ve stirred the almonds around–wondering when the sugar was every going to melt–them gotten distracted and almost burned the whole thing. One second you’ll still see white sugar, and then the next, it becomes clear and you have to hurry to make sure the sugar gets through all the nuts before they start to burn. 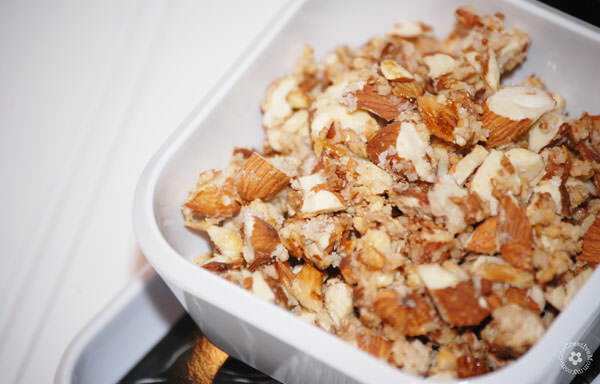 Think of those first few minutes of stirring as time to toast the nuts before the sugar melts. And–if you really want a challenge–try holding a camera with one hand, stirring with the other, and watching the whole process through the camera lens! (I wouldn’t recommend it!) I was pretty proud that I got decent pictures, and didn’t let the almonds burn. Could you do this with other nuts? Absolutely! 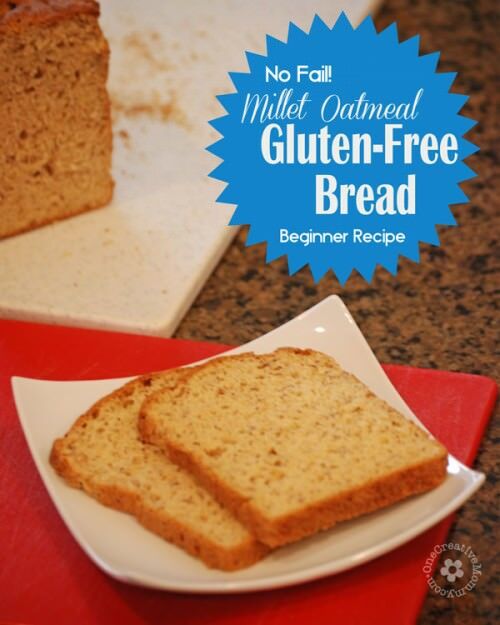 Could you add a little cinnamon or cocoa powder? I don’t see why not! Maybe I’ll try that next. Yum! 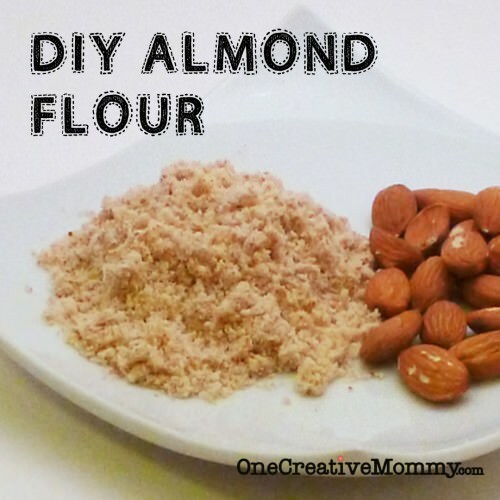 I love almonds and they are so good for you. I even have a small almond tree. Lucky! I’ve been trying to talk my hubby into an almond tree, but he thinks they are too messy. I’m sure they are–but it’s worth it, right? I’m addicted to nuts and I could eat the entire bowl of your sugared almonds! I laughed about holding the camera with one hand, stirring with the other. We need a camera man! I’ve done that so many times, but I have to say that your pics came out amazing! Have a wonderful weekend! Thanks so much, Alli! The almonds are in the freezer right now, and they are calling to me! Thanks for the compliments on my pictures. (My hubby got me a speed light for my birthday, and it makes a huge difference!) I need to take process pictures this week of drilling a hole into a tin can. I think I’ll enlist an assistant for that one. My own personal camera man would be awesome! Those look so so good! Now I really want to make a salad! Sugared almonds are so yummy and so easy to make! Thanks for sharing this today….it reminds me of how much I LOVE this treat! I’m off to Costco to pick up some almonds! I’m with you, Marilyn. This is a treat I have a really hard time putting down! Thanks, Heather. Have a great week, and enjoy the almonds this Fall! YUMMY! Always love putting those on a salad. Thanks, Jo-Lynne. Me, too. They really make a salad special. OMG! You are killing me with these! If I made them I would not be able to control myself! I have the same problem, Christina! This batch went straight into the freezer. Me, too, Mitzi. In fact, I don’t think I’ve ever met a nut I didn’t like! Yummy! My Mom makes a similar recipe at Christmas time. Thanks, Amanda. I always love linking up to your party! What a great post. I love candied pecans, so this should be pretty delicious. Ohhhh . . . candied pecans . . . ! That sounds so good! Now I’m really craving this. I will have to make these for my husband to try. He loves almonds. You should definitely try it, Heather. They’re so good!